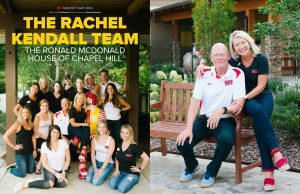 The Rachel Kendall Team was chosen by Top Producer Magazine to showcase in their December issue. We had so much fun volunteering at the Ronald McDonald House of Chapel Hill serving dinner for the families and being back in our RACH Kid’s Toy Store. Top Producer Magazine is a premier magazine devoted to informing the Triangle Real Estate Industry. We were excited to have been selected to share our story. Get a closer look at how our Annual Toy Drive is supporting this great cause. If you’re wondering how to get involved, reach out to our team today! Here’s the link to read the full article!